The Spacing Guild is an organization in Frank Herbert's science fiction Dune universe. With its monopoly on interstellar travel and banking, the power of the Guild is balanced against that of the Padishah Emperor as well as of the assembled noble Houses of the Landsraad. Mutated Guild Navigators use the spice drug melange to successfully navigate "folded space" and safely guide enormous heighliner starships from planet to planet instantaneously. Essentially apolitical, the Guild is primarily concerned with the flow of commerce and preservation of the economy that supports them; although their ability to dictate the terms of and fees for all transport gives them influence in the political arena, they do not pursue political goals beyond their economic ones. It is noted in Dune (1965) that Houses of the Imperium may contract with the Guild to be removed "to a place of safety outside the System"; in the past, some Houses in danger of ruin or defeat have "become renegade Houses, taking family atomics and shields and fleeing beyond the Imperium". The Guild controls a "sanctuary planet" (or planets) known as Tupile intended for such "defeated Houses of the Imperium ... Location(s) known only to the Guild and maintained inviolate under the Guild Peace". In Dune, Paul Atreides defeats Padishah Emperor Shaddam IV in a battle on Arrakis. He demands first the Emperor's daughter for a wife, which would make Paul heir to the throne, and second that the Emperor immediately step down. The demands are coupled with a threat to destroy the spice. Since that would end all interstellar transit, the Guild sides with Paul, threatening to strand the Emperor and his troops on Arrakis if he does not relinquish the throne. In 'Appendix A' of Dune, Herbert wrote that the Guild, along with the Bene Gesserit order, had been responsible for the standardization of religion in the Dune universe; they promoted the adoption of the Orange Catholic Bible and offered protection to the dissenting theologians who created this book. Nonetheless, in the same appendix, Herbert held that the Guild members themselves were atheists, and only promoted this move to promote a stable societal order from which they could profit. Navigators are made prescient by the spice (a requirement of being a pilot), and are sometimes utilized as such: In Dune Messiah (1969), a Navigator named Edric takes part in a plot to assassinate the Emperor, Paul Atreides. The presence of a prescient hides the activities of that person, and those around him, from other prescients; Edric's involvement is solely to protect the conspirators from Paul's prescient sight. In God Emperor of Dune (1981), God Emperor Leto II has secured complete control over of the scarce melange reserves through hydraulic despotism, making the Guild completely dependent on him. In the fifth and sixth novels of the series, Heretics of Dune (1984) and Chapterhouse: Dune (1985), 5,000 years after the reign of Paul Atreides (a period that includes 3,500 years of Leto II's reign and 1,500 years following his death), the technocrats of Ix develop technology that the Ixians and the Administrative faction of the Spacing Guild refer to as "compilers". These compilers perform calculations very similar to computers, nearly violating the prohibitions against "thinking machines" that were imposed following the Butlerian Jihad several millennia before. 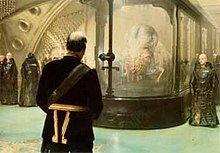 These compilers eliminate the need for the Navigators, and the strategic disadvantage that this aspect of melange dependency has become, because the Navigators' abilities are slowly being compromised by the severe reductions in the availability of spice resulting from the destruction of Dune and the sandworms on that planet, and the strict control by the Bene Gesserit, who maintain a monopoly over the largest stockpiles of melange. The prescient rule of Leto II that lasted 3,500 years has shown the universe the perils of prescience, namely that the entire universe can be locked into the vision of a single entity, giving that entity absolute power. The Guild, facing obsolescence and suspicion, couples itself with Ix in decline; Navigators continue to exist, but their importance in the universe is severely diminished. As Paul Atreides notes in Dune, it was the Spacing Guild's obsession with the "safe path" that led them "ever into stagnation", and brought on their eventual obsolescence. In Dune: House Corrino (2001), the third novel in the Prelude to Dune prequel trilogy by Brian Herbert and Kevin J. Anderson (1999–2001), it is reiterated that Aurelius Venport is believed to have founded the Guild. In the Brian Herbert/Kevin J. Anderson Legends of Dune prequel series (2002–2004), however, it is confirmed that his lover Norma Cenva, a mathematical genius with great psychic power, had in fact invented the space-folding ships which would eventually be called heighliners. Ever uncaring about her own fame, Norma credits the invention to Aurelius as a gift to him in Dune: The Battle of Corrin (2004). Norma discovers that an excessive dose of melange allows her to safely navigate the ships using prescience; she allows herself to mutate to perfect the process, becoming the first Navigator. Aurelius and Norma's son Adrien Venport establish the Foldspace Shipping Company and find the ten volunteers to become the initial group of Navigators. After consolidating its hold on the space travel industry during the events of Sisterhood of Dune, this company, now called "Venport Holdings" or even "VenHold", evolves into the Guild of the later novels. VenHold originally has the monopoly on foldspace travel, granted to Aurelius Venport by Serena Butler. However, decades after the end of the Butlerian Jihad, Emperor Jules revokes the monopoly in order to curry political favor, resulting in several rival foldspace companies springing up, such as Celestial Transport and EsconTran. These new companies, however, are unable to provide 100% safe transportation due to their lack of Navigators, the creation process of whom is a proprietary secret tightly held by VenHold. Director Josef Venport ruthlessly crushes the competition and even executes a rival CEO. In Emperor: Battle for Dune (2001), the Spacing Guild plays the role of a subhouse. It has its own private army with which it can back up its demands. The Guild uses its Heighliners to transport troops from the various homeworlds to Arrakis. Later in the game,they become evil, building an "Emperor Worm" through which they hope to rule the Universe. Depending on which House you use, and whether or not you win or lose, the campaign end cutscenes are different. ^ a b c d e Herbert, Frank (1965). Dune. ^ Herbert, Frank (1965). "Terminology of the Imperium: TUPILE". Dune. This page was last edited on 18 March 2019, at 17:09 (UTC).